15/23: First bedroom is at the foot of the stairs and has two twins that can be converted to a King upon request. 17/23: Second bedroom also on the first floor has a king size bed. Pilar’s Secret is tucked away in the heart of Key West just half a block off famous Duval Street. This hidden oasis is the perfect spot for you to truly discover the ultimate Key West experience. 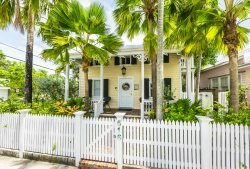 Located down a quiet nondescript lane this gorgeous property is positively Key West with well appointed luxury throughout. Pilar’s Secret offers three very spacious bedrooms, a private pool and wonderful gated outdoor living area. The fully equipped kitchen is adjacent to a large living space with plenty of room for all your guests to relax. Pilar’s Secret was designed for sharing with family or close friends. The spacious home makes a perfect home base for a group while they enjoy everything our island has to offer. The living area has plenty of seating on plush comfortable couches and chairs. One of the living room sofas pulls out into a sleeper sofa for added guests. The kitchen is just off the main living area with top-of-the-line appliances and all the tools you need to prepare a meal at home in between your nights out enjoying our island cuisine. There are many options for dining just a short walk from Pilar’s Secret. Lush tropical landscaping and comfortable chaise lounges and chairs surround the pool at Pilar’s Secret. This very private outdoor area has seating for lunch or dinner plus ample amounts of sun and shade throughout the day for perfect outdoor living. The pool can be heated and the BBQ is right there ready for your next meal poolside or at another larger outdoor dining table alongside of the house. String lights create an enchanting space come dusk along with beautiful landscape and pool lighting. There is also an outdoor shower for rinsing off after a day at the beach. There are two bedrooms located on the ground level of Pilar’s Secret. One bedroom has two twin beds that can be converted to a king bed upon request. The second bedroom has a king size bed, flat screen television and french doors out to the side patio. These two guest rooms share a bathroom with a glass shower and soaker tub. The second floor master suite is private with a king size bed, flat screen television, en-suite bathroom and your own separate seating area. The master bath has a unique spa-like shower. This is the perfect place to get away and wind down after an active day around Key West. Pilar’s Secret offers central A/C and heat and there are ceiling fans throughout. The private pool can also be heated upon request. The yard is private and provides lush landscape throughout. There is a BBQ grill and one private parking space. There is a Washer/Dryer, flat screen televisions in the living room and in each bedroom all with expanded cable TV. The gourmet kitchen has all the utensils for preparing your meals along with a microwave, blender, and toaster. Linens and towels are provided and housekeeping is available in the interim upon request. The home has wireless high-speed internet included. The property will accommodate up to 8 people with 3 bedrooms and a pull-out sofa. Pets are considered, please ask ahead of time.